Seldom found growing so tall or close together, this grove of mature red cedars is at the UW Arboretum. Someone recently asked, “How do the trees in forests grow by themselves?” I was stumped at first, because her question was so very broad. After collecting thoughts for a moment here is (more or less) what I came up with. Trees, like all plants, need: water, light, soil and shelter. In natural forests, new seedlings sprout from seeds that drop from trees above. Other seeds arrive on the wind dispersed from nearby trees. Still other trees arrive in the forest via animals such as squirrels who carry the seed from neighboring woodlands and bury them in the new forest. Chance determines which species arrive and what happens when they get there. Managed woodlands grow by choice, not by chance. State nurseries provide seedlings. Woodland managers decide the species mix, the planting plan, thinning and management practices. The result is a healthy woodland that provides habitat for a wide range of wildlife. It also produces high quality forest products like timber, pulp and maple syrup. Of course, natural regeneration needs to be included in forest management plans. Mature trees will produce seeds that sprout and help ensure the next generation. To the extent that mother nature does her bit, working with nature is a great strategy. Wise landowners understand that the jeanie is out of the bottle. Climate change, habitat loss and invasive species mean “letting nature take care of things” no longer works. Understanding what makes a natural forest requires knowing where forests come from and why they are where they are. Forests are the final stage in what biologists call natural plant community succession. It all begins with bare soil. The first plants to grow are grasses and forbs (wildflowers). They form plant communities called grasslands and prairies. If there are no serious disturbances (primarily wildfire) shrubs will find their way into the grasslands or prairie. As the percentage of shrub cover increases, tree seedlings follow. Trees use the shade of the shrubs to protected them from weather and soil moisture extremes. Some tree species, such as aspen, boxelder, birch and cottonwood do not need need shrub cover and can can colonized grasslands and prairies directly. 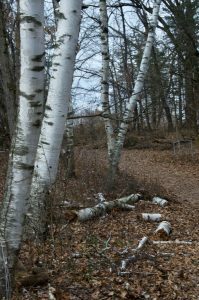 Birch is an early succession species that grows fast and quickly replaced by more shade tolerant trees. Pioneering tree species grow fast and need lots of sunlight. 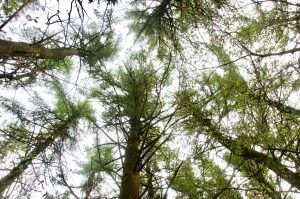 Because they cannot grow in shade, these early forest creators eventually are pushed out by more shade tolerant trees like maple and hemlock. The final stage of plant community succession is the shade tolerant forest. These tree species can germinate and grow with very little light. They do well in the cool damp conditions created by the deep shade of a tightly closed canopy. Before pioneer settlement, much of America frequent “natural disturbance events.” The most common of these events was fire. Lightning caused many of these fires burning over the land and pushing back the plant community succession. Native Americans also used fire. By periodically setting fire to grasslands and prairies they kept most shrubs and trees from growing. This was desirable because grasslands and prairies were more productive for game and made travel easier. Fire prevented late succession forests from developing; creating the grasslands, prairies and savannahs that covered southern and western Wisconsin. Some trees are fire adapted, which means that their bark is thick and can prevented them from being killed during by wildfire. 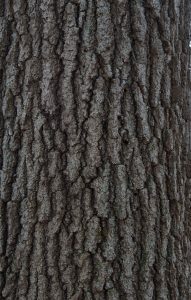 Oak and hickory trees are the iconic fire adapted trees of the midwest. They can withstand prairie fires that kill species like cherry and maple. Several species of pine are also fire adapted. Some like the loblolly grow in the southeast. Others like lodgepole and ponderosa pine are common western forest species. Because it takes time for the heavy protective bark to form on these fire adapted species, young seedlings would perish in prairie fires. Drought and animal browsing also take a heavy toll on seedlings For these reasons, woodlands created by these fire adapted species were sparse. They had open canopies that let light reach the ground between trees. The grasses and wildflowers that grew around the trees provided light fuels which caused fire to easily carry through the forests. Where fires were more frequent and trees even more widely spaced, the system that evolved was called a savannah. 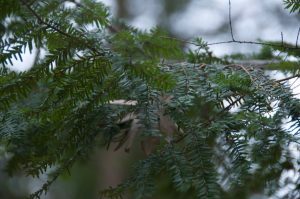 Balsam fir is a classic northern forest tree. It grows as an understory tree in shade where other trees find hard to make a living. Up north the snow pack is deeper and lasts later in the spring. Because of that soils are wetter and fire less frequent. Trees that were more shade tolerant and less fire adapted could gain a foothold. Swamps, and shady northern slopes provide the similar conditions for isolated woodland pockets in southern Wisconsin. Traditional Wisconsin oak hickory woodland. This would have been familiar to your parents of grandparents; before they got choked out by invasive shrubs and shade tolerant trees. Today, with humans surpassing wildfire, much of the former oak and hickory savannah is moving toward late succession forests. 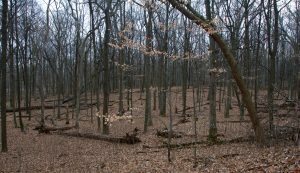 Wisconsin has lost more than 95% of its historic oak savannah. Oak and hickory are dying out of their historic woodlands replaced by more shade tolerant species. The closed canopy allows shade tolerant shrubs like buckthorn and honeysuckle to steel the remaining sunlight. The result is a serious decline of savannah and woodland wildflowers in Wisconsin. Likewise, western forests are becoming denser creating high fuel loads. This sets up conditions for the devastating wildfires that are plaguing the American west. Private landowners and public land managers who put in place forest management plans are making a difference. They use selective thinning, forestry mowing and prescribed fire to reduce fire loading and let more sunlight reach the forest floor. Wise stewardship is restoring healthy forests, woodlands and savannas. This is how we take protect our natural heritage. Forests, therefore, really do not grow by themselves. We steer its future; either by conscious management or benign neglect. It took 150 years of exploitation and total fire suppression to put our forests in their present condition. Wise stewardship and effective management can restore healthy forests over the next century. The choice is simple — it is, however, neither cheap nor easy.